Find and compare the best prices from a range of well known car rental companies at Kraków-Balice Airport. This is a free to use facility, enabeling you to book direct with the company quoting the price. Kraków-Balice Airport, otherwise known as John PaulI II International Airport, is located 11Km west of the city of Kraków, southern Poland - this vibrant city is the premier tourist destination in Poland as a result of its architecture and culture, plus the Tatra Mountains to the south offering skiing. 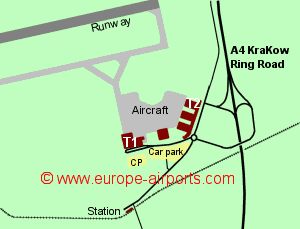 Krakow airport has two terminals, some distance apart. Terminal 1 is the main terminal, used for international flights, while Terminal 2 is used for domestic flights. A new terminal 1, built adjacent to the old terminal 1, was completed in 2015. The old terminal building is being refurbished to become an extension of the new one. The airport has rail and bus connections with Krakow and beyond. The new airport train station is close to Terminal 1 (behind the multistorey carpark). Trains depart approximately every 30 minutes during the busy parts of the day (less frequently at night) with a journey time to Krakow of 18 minutes, costing 10 PLN (approximately 2 Pounds). Bus from the airport into Kraków will cost around 4 PLN (approximately 0.80 Pounds). A free shuttle bus connects the two terminals and the railway station every 30 - 60 minutes. Taxi into Krakow should cost around 70PLN (approximately 14 Pounds)for the 20 minute journey. Terminal 1 airport has 12 bars/restaurants, 13 shops, an executive lounge, money exchange, 4 ATMs, VIP lounge and conference facilities, Internet access kiosks, and WiFi Internet access (FREE for 15mins). Terminal 2 has 2 bars/restaurants, 1 shop, ATM, and WiFi Internet access (FREE for 1 hr).